What if I were to tell you that weeks after the Francis Report into the failings at Mid Staffs, in order to stop my whistleblowing case being heard, well over £100k of taxpayer money was spent arguing junior doctors and agency workers out of whistleblowing protection? What if I were to tell you the former Secretary of State for Health, the Medical Union (the BMA) and the Medical Regulator (the GMC) knew about it and were all in on it? You would probably think I was mad, but what if I were to also tell you that last year we won whistleblowing protection back for all junior doctors and 800,000 agency workers in the Court of Appeal. Then in May this year my team caused a Government agency to concede a 4 day preliminary hearing at the last minute and to pay us £55k back in legal costs. My name is Dr Chris Day and I am a junior doctor that lost my career as a result of raising safety issues about an understaffed Intensive Care Unit in South London. After a 4 year battle it is now time for my individual whistleblowing case to finally be heard for the first time this October. Health Education England have requested an incredible 21 days for the hearing. In June 2017 at the NHS Confederation Conference, I asked Jeremy Hunt, the then Secretary of State for Health about the games that have been played at huge expense to the taxpayer to stop my case being heard for over 3 years. Mr Hunt was named as a respondent in my whistleblowing case and instructed the Treasury Solicitor to file a response to my comprehensive grounds of claims in 2014. I received his response. The Department of Health have attempted to deny the fact that Mr Hunt instructed solicitors in the case to a journalist and also that he had knowledge of the “facts” which he plainly did as a respondent. In May this year I went to meet Jeremy Hunt with my Solicitor Tim Johnson at a meeting arranged by Norman Lamb MP. The details of that meeting can be read here. Why a 4th Crowdfunding Campaign? I am only still standing as a result of all the support we have received from over 4,000 people and my fantastic team of lawyers. I am truly grateful and proud of what we have been able to achieve together. I have spent over 3 years fighting to win whistleblowing protection back for all junior doctors and their patients. This has taken the majority of what we have been able to crowdfund over the last 3 years and a lot of energy! The crowdfund has also had to be spent seeking legal advice and intervention against organisations such as the BMA and GMC that have attempted to obstruct our attempts to safeguard junior doctor whistleblowing protection. I now have to fund a 21 day hearing so that all the facts of my individual whistleblowing case can finally be heard properly and the relevant witnesses cross-examined. I summarised my case at 'Junior Doctors Getting Heard', an event hosted by Tim Johnson/ Law with a panel of other junior doctors and the former junior doctor and author Adam Kay. My NHS whistleblowing case was lodged in October 2014. The case involves an understaffed Intensive Care Unit in South London. My claim is that I lost my career and suffered other detriments on account of raising serious safety issues when I was working there. The case has been prevented from being heard by a court or tribunal for 4 years. However in May 2017, I won the right in the Court of Appeal for the case to be sent back to the Employment Tribunal after it was struck out in February 2015 without a hearing. I have been able to crowdfund £240,000 on the innovative access to justice platform Crowdjustice after my union, the BMA, withdrew legal support from the case several days before a legal deadline. The successful crowd funding campaign has put a spotlight on certain important issues that the case raises. Since 2015, well over £100k of public money has been spent creating an apparent gap in whistleblowing law affecting all junior doctors and agency workers in order to prevent my case being heard by an employment tribunal. We finally defeated these legally flawed arguments in the Court of Appeal in May 2017. However, Health Education England continued to claim my whistleblowing case could not be heard and that I and junior doctors were not covered by whistleblowing law. This was a hopeless position following our Court of Appeal victory. 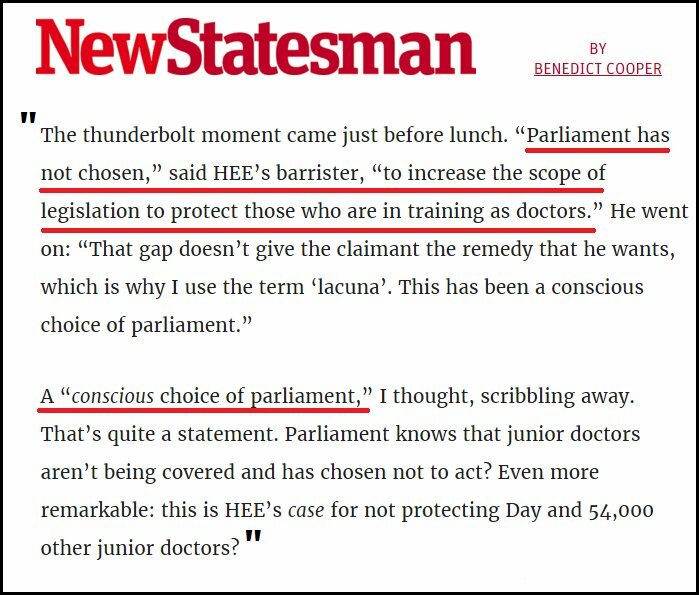 The HEE arguments relied on misrepresenting Parliament’s clearly stated intention for whistleblowing law, not disclosing a key contract to the courts and not being open about a separate stream of junior doctor contract negotiations with the BMA. In May 2018, at a preliminary hearing, HEE conceded at the last minute after the exchange of witness statements and were ordered to pay £55k costs to me. More details about this Hearing including the judgment can be found here. The existence of the apparent gap in the law caused by my case was denied by the Government and the medical establishment for over a year before finally being accepted in August 2016, weeks before the imposition of the new junior doctor contract. The gap was then apparently solved with a rushed agreement between the BMA and HEE that has been widely criticised by legal authorities because it does not provide statutory whistleblowing protection to junior doctors and might not even “get off the ground” in offering any kind of protection. James Laddie QC has provided an opinion on this agreement. 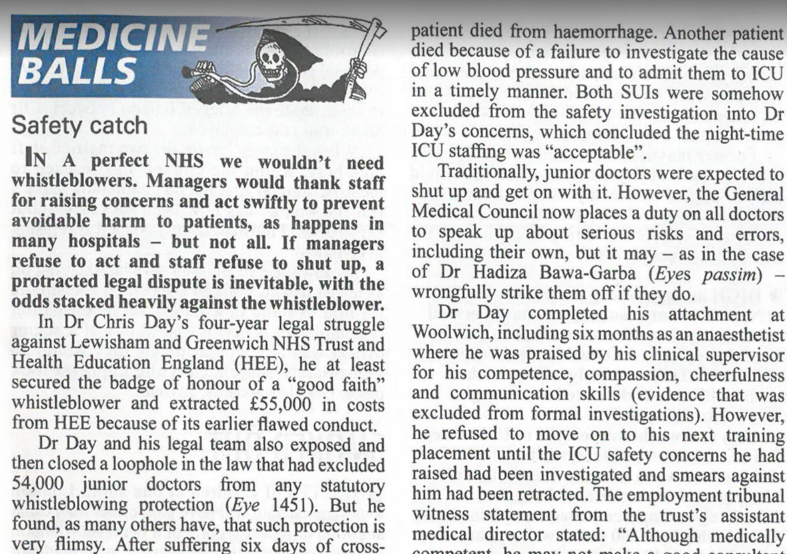 The whistleblowing charity Public Concern At Work have also criticised the agreement and the BMA in a paper. The serious safety issues at the centre of my case were not acted on in 2013 and the situations described in my protected disclosures were termed acceptable by NHS formal investigations. It has taken until 2017 for the serious staffing issues in my former ICU to be acknowledged by the NHS. The relevant NHS England Peer Review can be read here. The General Medical Council, after initially attempting to deny the problem with whistleblowing law caused by my case finally acknowledged the danger to patient safety associated with arguing junior doctors out of whistleblowing protection. Earlier in the year I wrote to Shadow Health Minister Justin Madders MP about my case. On 18 July 2018 in Parliament Justin Madders MP asked a Health Minister to account for the Department of Health actions in my case but his questions were not responded to by the Minister. The case was also covered by ITV News at Ten. More media coverage can be found here. My trade union, the BMA, initially supported my case and their law firm, Gateley, were preparing proceedings against the Trust and Deanery/HEE. The BMA insisted that the NHS and HEE carry out formal investigations. Suddenly, five working days before the claim had to be submitted and before the delayed Trust and Deanery formal investigations had reported, the BMA withdrew all legal help from my case. Around the same time my BMA Senior Industrial Relations Officer went on “special leave”. I have since learned from a transcript of a BMA Council meeting that Dr Mark Porter, the former BMA Chair, stated that he had been dismissed for gross misconduct. It is also the case that the record the same BMA representative prepared of a crucial meeting apparently no longer exists. The Legal Ombudsman made several criticisms of Gateley but stated that they did not have the power to investigate any action of the BMA and in particular the circumstances in which my BMA rep was removed from my case and the BMA. Several months after pulling out from my individual case, the BMA made a separate decision not to support our now successful appeal process to safeguard junior doctor and agency worker whistleblowing protection. I find it difficult to comprehend why the NHS has spent taxpayers’ money to try to argue junior doctors out of whistleblowing protection and, secondly, why the main doctors' union decided not to oppose this. There have been several brave BMA Committee members that have attempted to get answers from BMA leaders about my case as this blog explores. This BMA Council transcript exposes the former BMA chair, Dr Mark Porter providing false statements about my case to BMA Council. GP Dr Bob Gill has produced this video summarising the BMA’s actions in my case. Given how much resistance there has been in order to prevent my case being heard, it is vital, now that we have secured a hearing, that we have the resources to ensure the right people are held to account for this situation. I am grateful to all the lawyers that have helped me including all at Tim Johnson/Law, James Laddie QC, Thomas Linden QC and Chris Milsom. I am also grateful to Public Concern At Work and Crowdjustice for their support. I would like to thank all our supporters on Crowdjustice as you have given us so much more than money. For a timeline of events and key court documents surrounding my case click here. Thank you for doing this on behalf of all of us. Keep strong. Your efforts and struggles are valued and appreciated. Keep strong. 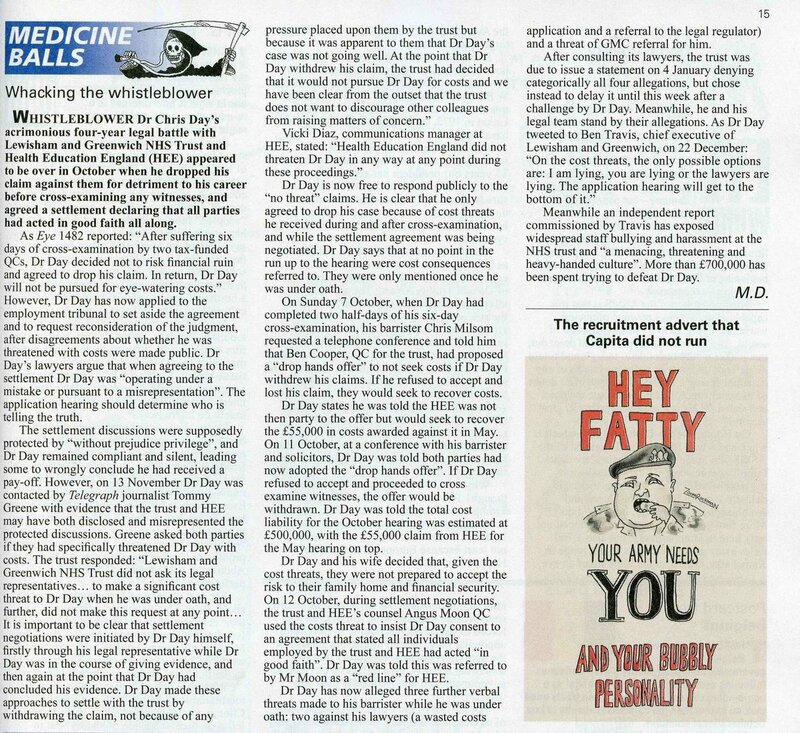 We are very grateful to Private Eye and Dr Phil Hammond for the coverage that has been given to our case over the last few years. The November article and others can be read here. The Telegraph Article and letter to the Respondents referred to in Private Eye can be read here. Dr Day blew the whistle by raising patient safety concerns in good faith. Dr Day has performed a public service in establishing additional whistleblowing protection for junior doctors. The Tribunal is likely to find that both the Trust and HEE acted in good faith towards Dr Day following his whistleblowing and that Dr Day has not been treated detrimentally on the grounds of whistleblowing. Dr Day's claims are dismissed upon withdrawal. We would like to thank you for your encouragement and generosity. We are very proud of what we have been able to achieve together with our supporters on Crowd Justice.